Kevin checks in regarding yuan gold pricing. Yuan Gold (XAUCNY) is gold leading the way higher through 9000 RMB per ounce and through US Gold $1380 US its swing high equivalent. 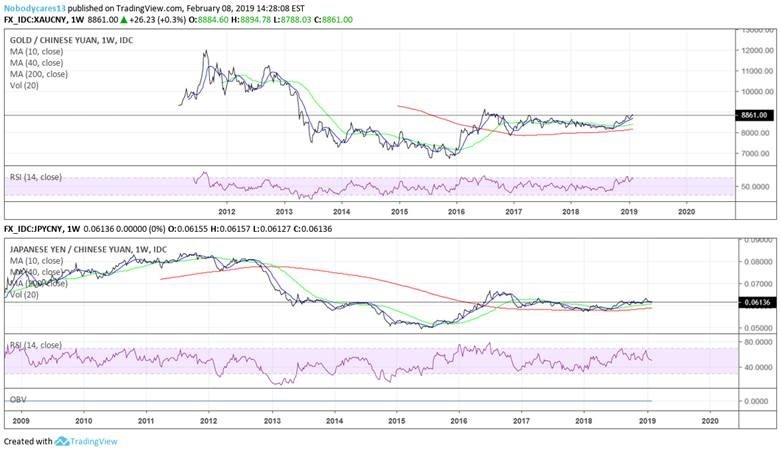 And the only way to prevent much higher US Gold prices from there, is for more pronounced weakness in Chinese Yuan against the dollar (CNYUSD). 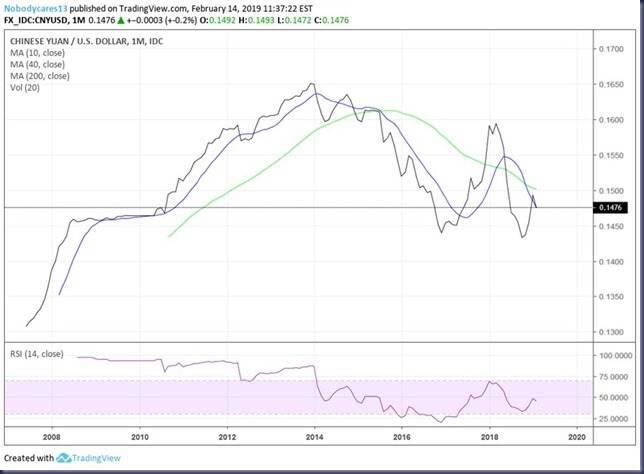 IMO, a weaker Chinese Yuan (CNYUSD) exchange rate is not desirable by the Fed, Treasury, ESF, the President’s Working Group on Financial Markets nor the PBOC/SAFE. 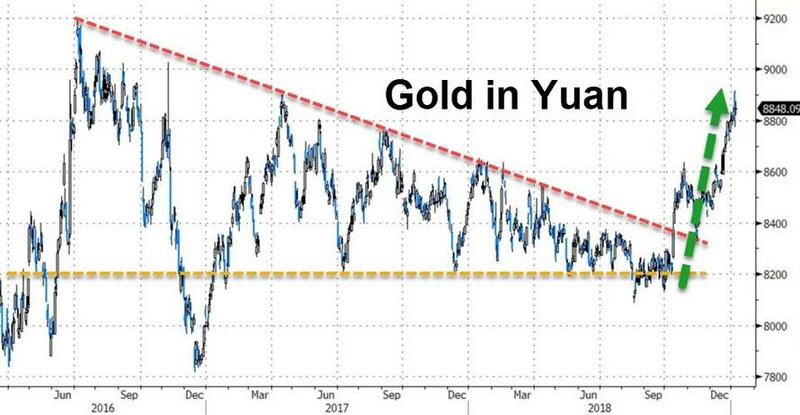 And to be sure, a higher Yuan Gold (XAUCNY) price is the last thing the Fed, Treasury, ESF, the President’s Working Group on Financial Markets seek but is at the top of the bullet point list of the PBOC/SAFE white papers for meeting the CCP goals of prosperity. Albeit a weaker Chinese Yuan (CNYUSD) may have been tolerated by the FED and Treasury when the U.S. and world economy was buzzing along nicely with PBOC/SAFE accumulating new U.S. Treasury offerings. However, a weaker Chinese Yuan (CNYUSD) is certainly not desired by U.S. now. 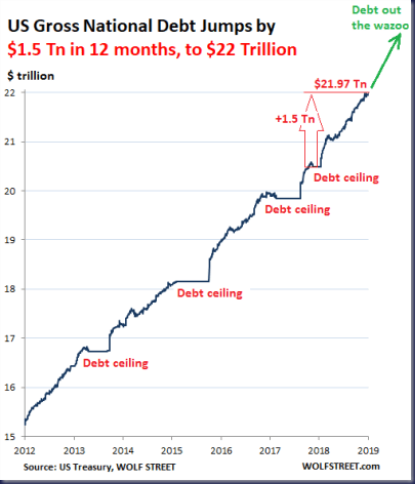 Trade wars, embargoes, worldwide economic slowdown, and debt saturation still can’t create an environment that encourages PBOC/SAFE or other foreign CB’s to accumulate U.S. Treasuries. 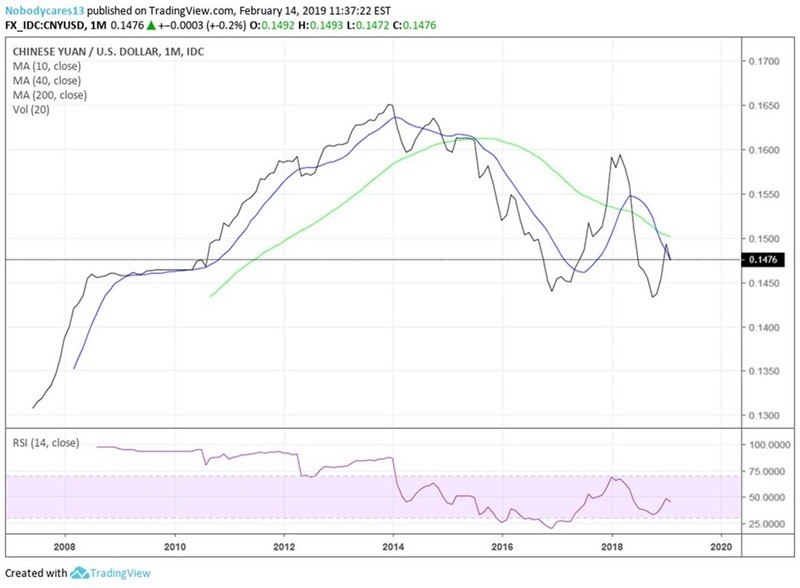 And for China itself, a lower Chinese Yuan (CNYUSD) may help Chinese exports but conversely also increases the FX debt burden of Chinese borrowers, albeit a small one, who borrow in dollars but whose revenue is denominated in Yuan. 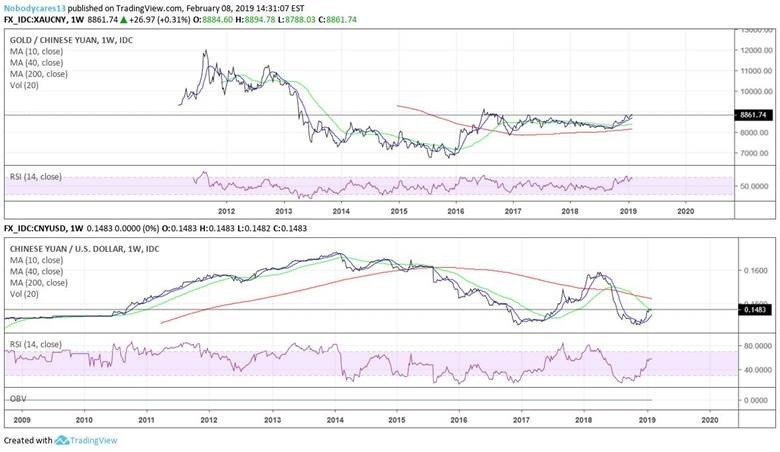 However, a higher or stable Chinese Yuan (CNYUSD) clearly increases the standard of living for its burgeoning middle class that represents the biggest meal ticket for the next 50 years for those same Chinese companies that are currently exporting to U.S. but have their eye squarely on their own domestic market’s near and long term growth. 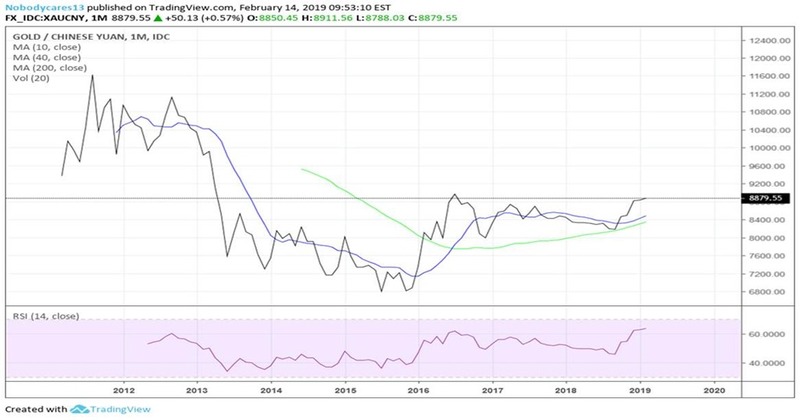 Conclusion: Chinese Yuan (CNYUSD) stability at a minimum and strength are likely now that the world economic slowdown, ensuing financial collapse is on. 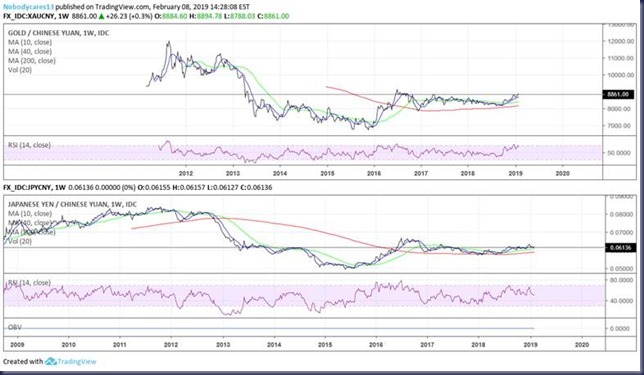 And when the dust settles, it will be gold dust in China and paper ash in the U.S.
https://www.credit-suisse.com/corporate/en/research/research-institute/global-wealth-report.html total Chinese Household Net Worth equals about $51.8T. Average Chinese wealth has enjoyed a 10% annual increase since 2008 while the median Chinese household has enjoyed a lesser yet respectable 7% annual increase. At the current Yuan Gold (XAUCNY) price of 8879 the value of 530 million ounce is about $700B US representing 1.4% of total Chinese Household Net Worth. 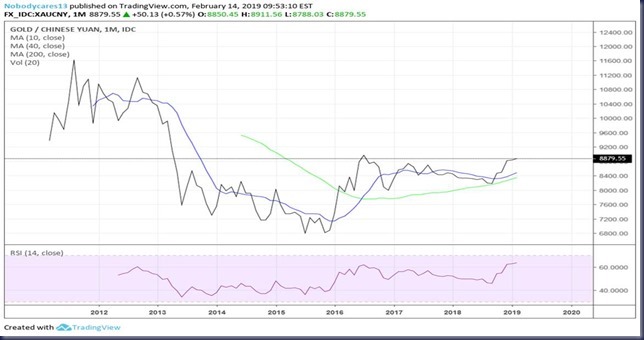 Bearing in mind that not all of that non-monetary gold is in the hands of households, but it is clear that it is not in the hands of the PBOC/SAFE. So ask yourself two questions. 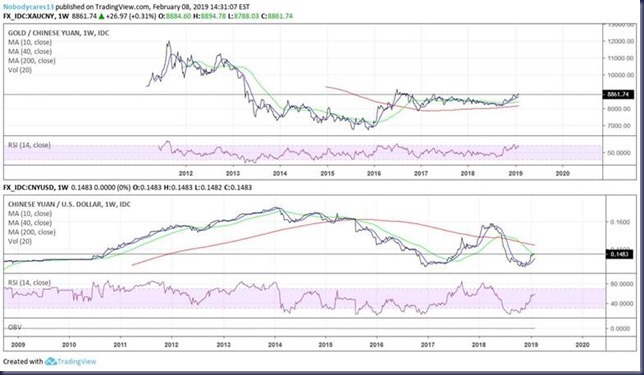 Do you think that the PBOC/SAFE would encourage its private sector and households to accumulate so much gold if it was not meant to be a sound investment that increased in value? 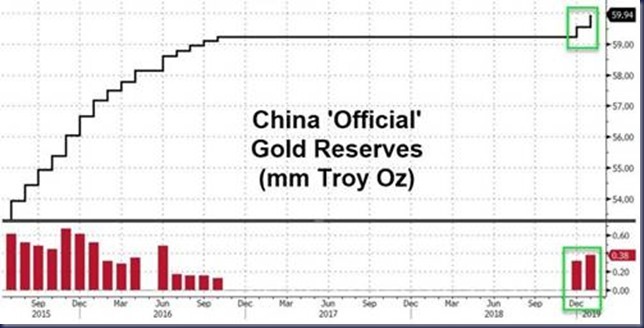 Do you think that the private sector in China has accumulated more gold than the PBOC/SAFE? IMO the answer is “no” to both questions. 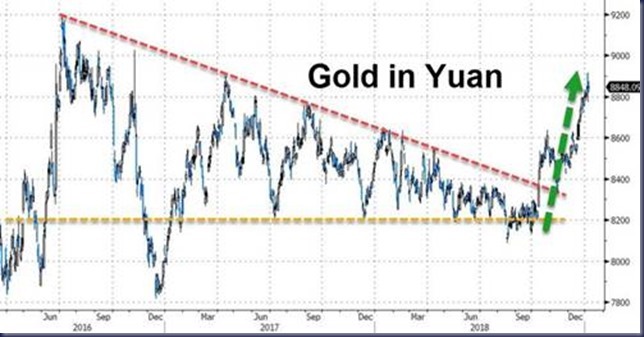 But how much Chinese PBOC/SAFE monetary gold or how much value of that monetary gold is enough to create a new Chinese Style Bretton Woods agreement so to speak with a twist that involves true price discovery of physical Yuan Gold (XAUCNY) not just a U.S. dictated price that the 1944-45 agreement dictated. Paraphrasing James Dines’ in The Invisible Crash published in 1975, “Back then only the U.S. could change the price of gold, and all other nations were forced to upvalue or devalue in terms of dollars. And the world’s currencies were expressed in and closely held in dollars. The problem was that Bretton Woods required reserves to be composed of either gold or any currency convertible into gold. And that was the killer because it included the dollar that was run into the ground through debt creation while gold prices were fixed at an abnormally low price.” For a Chinese Style Bretton Woods system to work, true price discovery for Yuan Gold (XAUCNY) must exist and PBOC/SAFE need an ample amount of current gold reserves and future gold reserves to maintain the value of the YUAN. According Charles A. Coombs, former Senior Vice President of Federal Reserve Bank of New York responsible for U.S. Treasury and Federal Reserve operations in the gold and foreign exchange markets in his book The Arena of International Finance, to paraphrase, “At the end of the war and beginning of Bretton Woods system the U.S. gold stock amounted to $20B roughly 60% of total official central bank gold reserves and amounted to 4x the value of total dollar reserves of all foreign central banks and foreign dollar deposits.” Doing that today for the US would be impossible with only 8,133 MT or 261.5M ounces unless it were valued at 4x the $6.7T of allocated and unallocated US dollar exchange value held by foreign central banks. That would require the value of 8,133 MT of US gold to be worth $26.8T or $100,000/oz. But for the Chinese the picture is quite different. 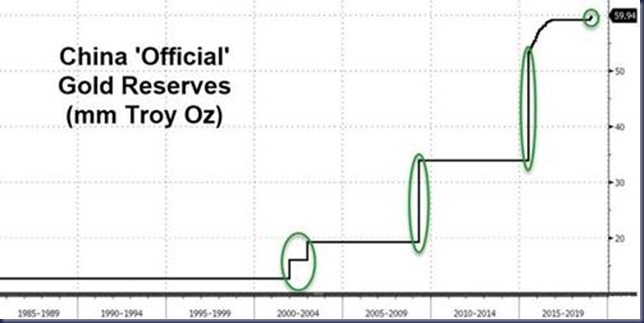 If PBOC/SAFE true current gold reserves were to amount to 60% of all central bank reserves like the US had in 1945 or even 70% like the US had as late as 1957, some 20,000 MT seems reasonable, and it also amounts to slightly more than the Chinese private sector’s 17,000 MT. 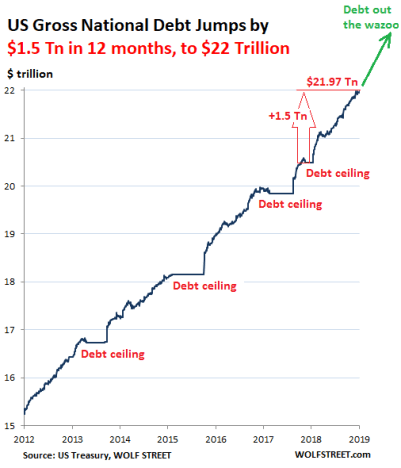 If those 20,000 MT or 643 million ounces had a value of 4x external Yuan debt, it would need to be valued at $6.8T or US Gold $10,575. That means either a stable Chinese Yuan (CNYUSD) and an 7x increase in Yuan Gold (XAUCNY) or a combination thereof. Makes no difference to $US Gold because mathematically: Yuan Gold (XAUCNY) x Chinese Yuan (CNYUSD) = $US Gold Price. And it makes no difference to Chinese Official or private sector as it is a win win for them too. Posted February 13th, 2019 by Jim Sinclair & filed under Jim's Mailbox. There 2 points of interest in this article. Yes Virginia, there IS a difference between the State and the Government! The State is the people, the government is not. These numbers show how astonishingly low the price of gold is currently, relative to the indebtedness of countries. “..the Bank of Italy has the third-largest central bank holding of gold reserves in the world after the US and Germany, owning 2,452 tonnes according to the World Gold Council, which at today’s prices would amount to just over $103 billion. The numbers revolving around debt, not only in Italy but throughout the world, are beyond human comprehension. Gold at $10,000 an ounce now seems like a trifle! The USA does not like oil traded out side of the petrodollar. We need to keep shining light on fake news from MSM. Funny how when President Trump does what the neocons want MSM gives it positive coverage. Posted February 10th, 2019 by Jim Sinclair & filed under Jim's Mailbox. The western Governments are turning on their own people. We saw this in Occupy Wall Street. Watch the first couple minutes, see for yourselves. Q’s latest post, I wish I had written this – it is so correct! Posted February 9th, 2019 by Jim Sinclair & filed under Jim's Mailbox. Posted February 8th, 2019 by Bill Holter & filed under Jim's Mailbox. Posted February 7th, 2019 by Jim Sinclair & filed under Jim's Mailbox. Posted February 4th, 2019 by Jim Sinclair & filed under Jim's Mailbox. Page queried in 0.723 seconds.